AMC's Western drama 'Hell on Wheels' is set to return for the first half of its fifth and final season on beginning on Sat. July 18th at 9pm e/p. The network will air 7 new episodes this summer, with the final 7 episodes to air sometime in 2016. Starring Anson Mount and Colm Meaney, “Hell on Wheels” examines the institutionalized greed and corruption behind the building of America’s Transcontinental Railroad as loyalties are abandoned and the race between the Central Pacific and Union Pacific lines intensifies. 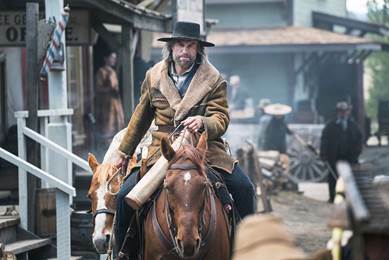 In season 5, Cullen Bohannon (Mount) finds himself a stranger in a strange land – the mountain town of Truckee, Calif., home to the Central Pacific Railroad. This rough railroad town teems with thousands of Chinese workers, foreign in language, culture and traditions. Despite the challenges of corralling his new workforce, Cullen leads the Herculean effort to tunnel through the Sierra Nevada Mountains, sometimes achieving only inches a day in the race to complete the first Transcontinental Railroad. 'Heroes Reborn' The Game? YES! 'Strike Back' Returns For Final Season! 'Bitten' The Complete Second Season Giveaway!